Another detail of Barack Obama’s tiny Orwellian World has been published yesterday by Jeremy Scahill and Ryan Deveraux on The Intercept. 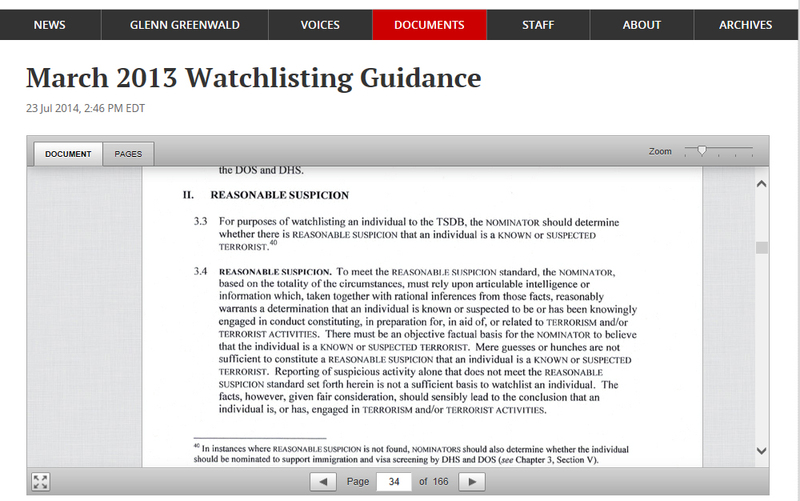 A watchlisting guidance for potential informers (NOMINATORS) who ultimately would put the life of their targets (NOMINEES) at risk, not just off the fly list. It’s about who is a TERRORIST suspect. Next would probably be listing on Obama’s kill list, and then the drones may lift off. I have briefly scanned the 166 pages and immediately noted excessive use of capitals to alert potential informers about the dangerous TERRORIST suspects. This seems to be really serious. I was even testing whether current war criminals such as Benjamin Netanyahu would fit the REASONABLE SUSPICION category. Maybe Obama has to denounce his entire previous administration, Bush, Cheney, Rumsfeld, not to forget Condi Rice. It is said that the Guidance does not stem from Edward Snowden’s leaked NSA files. At least some employees in the American intelligence community seem to sense that this guide does not entirely fit the American constitution. 24 July 2014 @ 7:53 pm. Last modified July 24, 2014. This entry was posted in Terrorism, USA and tagged Jeremy Scahill, Ryan Deveraux, terrorism, watchlist guide. Bookmark the permalink.